This is a rich moist cake. If you like rum raisin ice cream this cake is for you. Makes 1 cake, serves 12. Cream butter, 1/2 cup granulated sugar, and brown sugar together until fluffy, and then beat eggs in one at a time. Combine flour, salt and baking soda and add alternately with sour milk. Stir in raisins, orange rind, lemon rind, and walnuts and mix well. 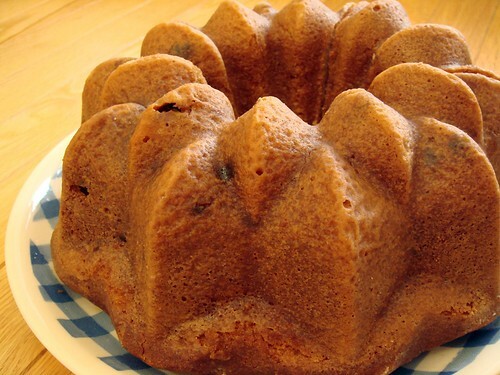 Pour batter into a greased 9 or 10 inch bundt pan. Bake in a pre heated 350 degree oven about 1 hour. Remove from oven and cool in pan for 15 or 20 minutes. Turn cake out onto a rimmed serving plate. Combine orange juice, lemon juice, rum and 1/2 cup granulated sugar and mix thoroughly. Using a skewer, pole some holes in the top of the cake. Slowly spoon rum mixture over the cake. Keep spooning up excess mixture from plate onto cake until all is absorbed.